Green, red, blue, black, etc... Of course, the surface color is an important aspect of dampers. 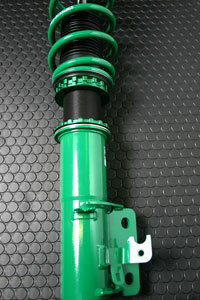 Thanks to the color, now many people recognize green dampers as TEIN's. But, do you know there is more important factor in surface finish than just a cloor? It is the fight against rust. 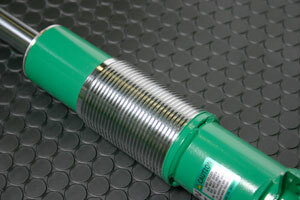 Most dampers are mainly made of steel. Colorful surface treatments are not only for the brand image but also are given a great task to protect steel. Why do dampers have to fight against rust? Here, we would like to take a closer look at steel rust. What is rust? That subject requires a whole textbook to explain, so we'll skip that here. Steel, in particular, gets rusted when it comes in contact with the oxygen and water. As you know, dampers are installed inner side of tires, where they can get plenty of oxygen and water! In addition, they face various objects thrown up by tires; dusts, gravels, snow-melting agent and who-knows-what. Needless to say, all these could lead to rust. Now, you see that dampers have to deliver good performance even under such harsh conditions, constantly fighting against rust. Well, how can steel rust be prevented? Among wide variety of methods, the most popular one is "surface treatment" which generally uses some sort of substance painted on or bonded to the surface of steel parts. To be exact, the surface treatment is not to stop steel rust, but it is to slow down the corrosion process as much as possible. There are various surface treatment methods available. Paint is probably the first thing that comes to most people's minds. Paint is applied to the surface of steel, to prevent it from coming in contact with rust-causing oxygen and water. Another common method is plating. Plating not only makes the products look great, but also protect surface from rusting just as the paint. 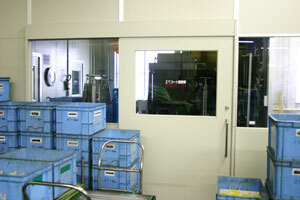 Paint and plating have been the major methods used on dampers for quite some time now. The majority of dampers, even now, use either of these methods for protection against rust and for better look. 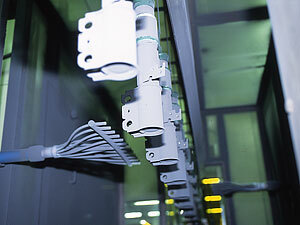 Plating & paint are most commonly used surface treatments on dampers. What are the requirements for paints on dampers? There are all kinds of paints; different means and different materials. Applying paints unsuitable for dampers would cause paints to get ruined quickly and then cause the surface to rust. Well, what are the requirements for paints on dampers? Firstly, paints should not come off easily. 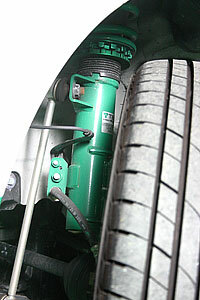 As already mentioned, dampers are exposed to various substances thrown up by tires. Drivers are not usually aware, but lots of different things are hitting dampers' surface while driving. If paints chip and peel easily when such gravels etc hit, dampers' surface soon starts to rust from that part and rust spreads out to whole surface. Damper's surface treatment has to resist flying pebbles etc. Paints on dampers' surface have to have high anti-chip property, so that chipping and/or peeling do not occur easily when gravels etc hit. Another requirement, actually, is the appearance. 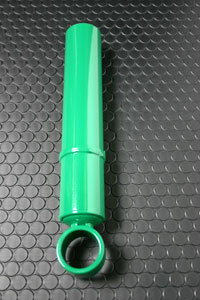 You would not pay a lot of money for dull-colored ugly dampers even if those have strong anti-rust paints on, would you? If performances are the same, you would go for the better looking one for sure. Also, to have the products in corporate/brand color is the very important part. Surface treatment is an important factor in maintaining brand image. As you can see, paints used on dampers' surface have to be highly resistant against chipping, to withstand various foreign matters, and also have to have great appearance. 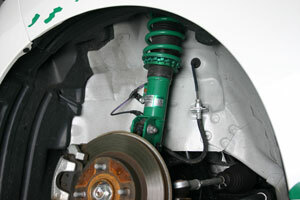 Paint used on TEIN dampers differs from common paints available everywhere and its technology is patented! TEIN has been using powder paint. Paints, most of you imagine, would be the thinner-smelling liquid ones; sprayed onto the surface and let dried. Painting facility at TEIN's factory does not smell like paint thinner at all. It's because TEIN's paint does not contain such toxic substances and hence has very minimal impact on environment. Here's the secret! TEIN uses powder paint! Now, we would like to explain the patented painting technology! First is anti-chip performance. In order to improve the adhesiveness of paint to surface, we apply blast finish to base surface. Specially formulated blast powder is thrown against steel surface to make it somewhat textured. This makes paint bond to steel surface better, and hence highly improves anti-chip performance. Next is this. Gray powder may look low-key, but is highly conscientious, enough to make self-sacrifice to protect steel. It's a base coat made of zinc. Last, but obviously not least, is this. 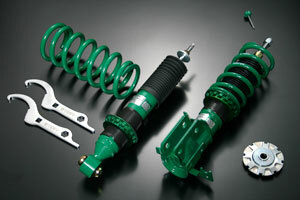 What's more green than TEIN dampers! 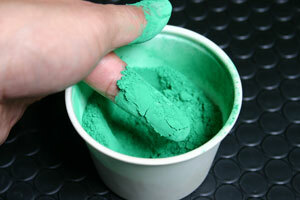 This is green-color powder paint. Of course, this green powder is strong against chipping. Not only that, its finish is very beautiful glossy green. Through these processes, with these paints, now we're onto the actual coating process. 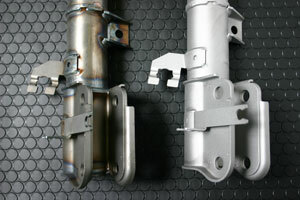 Parts/components to be painted are first placed on hungers and positive electricity flows from hungers to hanged parts. 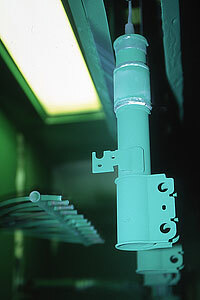 Parts, then, are moved into the painting booth, where powder paints are sprayed on. Powder paints are charged with negative electricity. Negatively charged powders are attracted to positively charged parts. With this, every inch of parts is completely covered with powder paints, leaving absolutely no spot unpainted. At the first booth, zinc powder is sprayed as a base. General powder painting method requires 1 baking process per 1 powder coating; so 2-layer coating has to go through baking process twice. It takes about 1 hour for spraying and baking process... It means that 2-layer requires 2 hours to complete. Now, this is what differentiates TEIN from the rest. 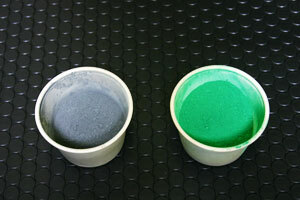 After continual trial and error, TEIN has developed 2-layer/1-bake method that requires only 1 baking process for 2 layers of sprayed paints and has received a patent for this technology. This method has very low success rate and is even quite rare in Japan. Being able to finish 2-layer process in only half the normal time leads to cost reduction. Establishing highly corrosion-resistant painting technique and keeping product prices as low as possible; these two conflicting goals are well achieved with this patented technology! Isn't TEIN's full-length adjustable damper black? Well, yes. Aforementioned powder painting technology is for dampers with thread-type adjustment, such as STREET BASIS and STREET ADVANCE. 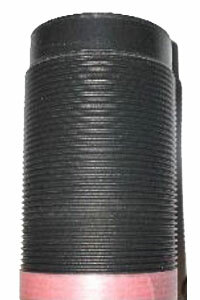 As you might be aware, threaded part of shell case for full-length adjustable dampers, such as MONO FLEX and SUPER FLEX WAGON, however, is black. Is that different from the powder paint? Yes, it is. 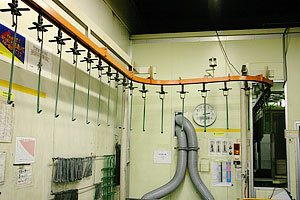 It is quite a hassle to process surface treatment on full-length adjustable dampers. 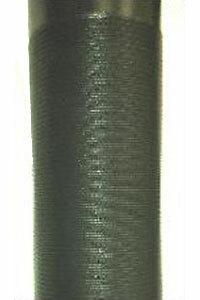 It is because the whole surface of shell cases is threaded. Spring seats and brackets move along these threads repeatedly and it's going to be difficult for even the toughest anti-chip paints to survive such conditions. Now, you see, shell cases for the full-length adjustable dampers have to go through different surface treatment process. 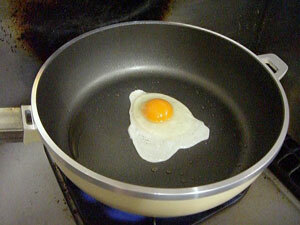 In general, the most commonly used method is plating. TEIN, however, has come up with the treatment which is far better in corrosion-protection than plating! Unfortunately, we can not explain the details of this coating, as the related patent is still pending at the moment. Let's just say it is a type of fluorine coating. Fluorine-based coating methods/processes nowadays are used in many fields and provide superior protection against corrosion. We took this technology to the next level and developed the special formula most suitable for dampers. 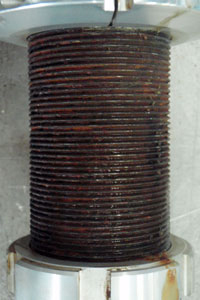 Requirements for such surface treatment on full-length adjustable dampers differ somewhat from the foregoing powder paint. It has to be, of course, tough against rust, but in addition, it has to withstand the repeated movements of spring seats and brackets and not to peel off easily, and the finished surface has to be flawless so that spring seats and brackets can move as smoothly as possible. 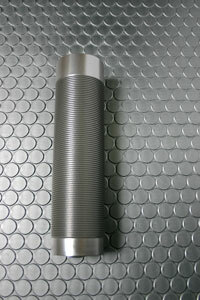 Stuck threads could be fatal to full-length adjustment; hence the smoothness is the key. As all threads are covered, unevenness is the great enemy. 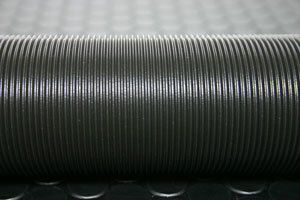 Threads are made up of small continuous ridges and roots. If coating is applied ordinarily, there would only be a thin layer on ridges but the paint could get piled up in roots. This way, ridges get rusted easily and parts get stuck in roots. ZT coating may look totally different from ordinary paint, but it actually shares many things in common. The first blast finish is the same, to improve adhesiveness and anti-chip performance. 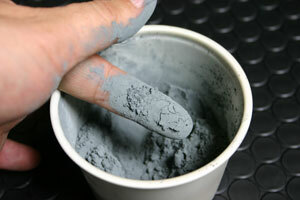 Then the same zinc is used as base, but this coating is not in the form of powder. Top ZT layer is not powder either. There are lots of secrets in painting process as well. 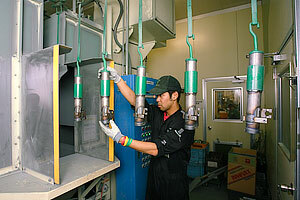 TEIN has invented own method to evenly apply paints on threaded surface; even on top of ridges and at bottom of roots. 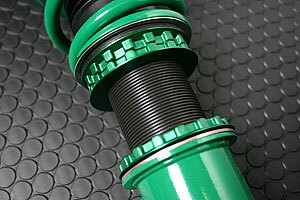 With this technology, partial corrosion and/or thread adhesion can be prevented! How well does the secretive ZT Coating work? As ZT coating is exclusively developed for use on ride height adjustable dampers, we have put it to the unique durability tests during the development process! Bracket is installed onto shell case treated with ZT coating, and then screwed back and forth repeatedly. Also, spring seat is attached and moved up and down under the normal working load. With these, ZT coating has been thoroughly tested to improve its anti-chip performance. Those were not enough for us yet. Shell case which has already gone through durability test is now tested for corrosion-resistance using salt spray tester, for 1,000 long hours! 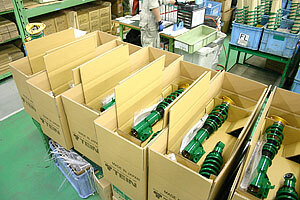 Other manufacturers only test for maximum of 500 hours, but TEIN's test lasts twice that much. Also, TEIN uses shell case which has been already tested for durability, not just-painted ones, to perform the test under unfavorable conditions. Take a look! Do you see any rust? No, the surface is not corroded at all. After such tough tests, ZT coating has absolutely no chipping/peeling, which could lead to rust! Just for comparison, this is other manufacturer's shell case, only went through salt spray test for 300 hours. As you can see clearly from this, our ZT coating is far superior and most suitable surface treatment for ride height adjustable dampers. 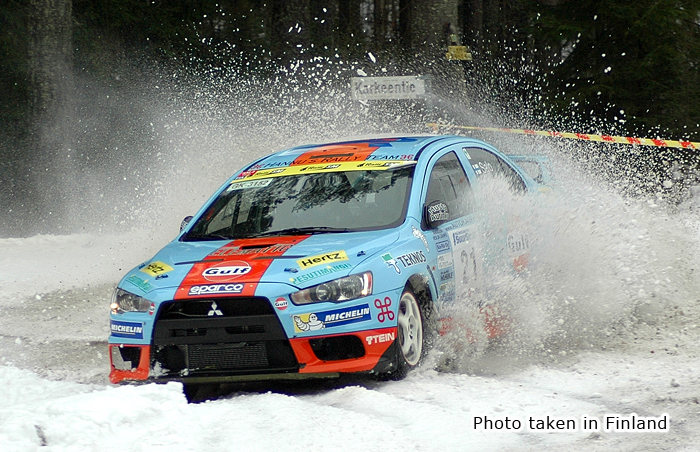 Shock absorbers for rally always face a variety of harsh extreme conditions. A short while ago, we have received messages from customers; the threads started to rust, spring seat got stuck and would not move, etc. Especially in snow-fall area, snow-melting agent sprayed on road surfaces has profound effect on dampers. It is even a real pain in the neck for auto manufacturers. We can not just let that discourage residents of snow-fall area from using ride height adjustable dampers! We have reviewed different types of surface treatments, tested them on machines, and actually tested them on snowy roads. Now, at last, we have developed the surface treatment to wipe out all your worries for rust problems. It is not enough for us, though. We are not yet fully satisfied. There are countries and regions where stronger/tougher snow-melting agent is used. At WRC events, suspensions face rough and harsh conditions beyond compare. Our products are not yet fully capable of dealing with such tough conditions. We may be able to feel a little relieved when we create products that are completely rust-free in any environment.